Last year featured big revenue declines, significant losses, and a major product failure. 2017 should be better -- if only because it can't get any worse. Shares of action camera company GoPro (NASDAQ:GPRO) tumbled 51.6% in 2016, according to data provided by S&P Global Market Intelligence. A steep revenue and earnings decline reported in February snowballed into a full-blown disaster, with four consecutive quarters of year-over-year revenue declines of 30% or more. The launch of the Karma drone in October, which was recalled almost immediately and has not yet been made available again, added insult to injury. GoPro reported a 31.1% year-over-year decline in revenue during the fourth quarter of 2015, results for which were announced in February. An impressive profit in the prior-year period was transformed into a loss, and the company guided for another big revenue decline during the first quarter of 2016. A statement from GoPro CEO Nick Woodman failed the grasp the severity of the situation: "In 2015, we recorded 16% year-over-year revenue growth and the fourth quarter represented the second highest revenue quarter in the company's history. However, growth slowed in the second half of the year and we recognize the need to develop software solutions that make it easier for our customers to offload, access and edit their GoPro content." GoPro would go on to report three more miserable quarters, with year-over-year revenue declining by 49.5%, 47.4%, and 39.9% in the following quarters, respectively. During the third quarter, GoPro posted a $104 million net loss on just $241 million of revenue, the fourth consecutive quarterly loss. Through the first nine months of 2016, GoPro's net loss totaled $303 million. GoPro is now working to slash costs, closing its entertainment business and laying off employees. Operating expenses are expected to drop considerably in 2017, although the company still expects to report a GAAP net loss this year. The launch of GoPro's first drone, Karma, was supposed to aid in the company's turnaround efforts. The drone finally launched in October after a months-long delay, but a problem with some units falling out of the sky led the company to recall the 2,500 drones it had sold. The $800 drone is still unavailable on GoPro's website, and it's unclear if and when it will be available again. GoPro expects to produce double-digit revenue growth during 2017, but only because 2016 was such an awful year. The company now claims to be an "end-to-end hardware and software storytelling solution." Investors should hope that GoPro's turnaround plan runs deeper than coming up with new ways to describe itself. 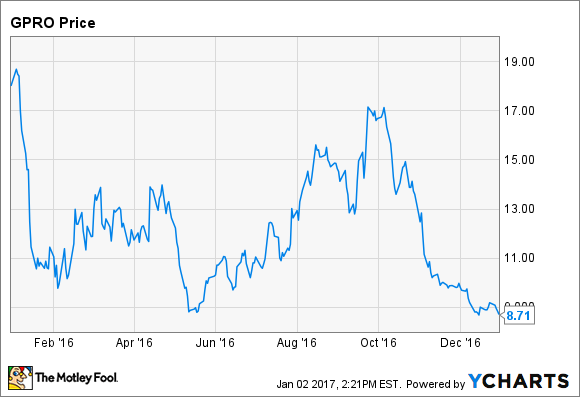 If GoPro can rebound in 2017 and beyond, the stock could soar from its currently depressed level. A turnaround, though, is far from guaranteed. The almost unbelievable failure of the Karma drone is as good a sign as any that new management may be required to right the ship. Execution problems like those plaguing Karma bode poorly for GoPro going forward.